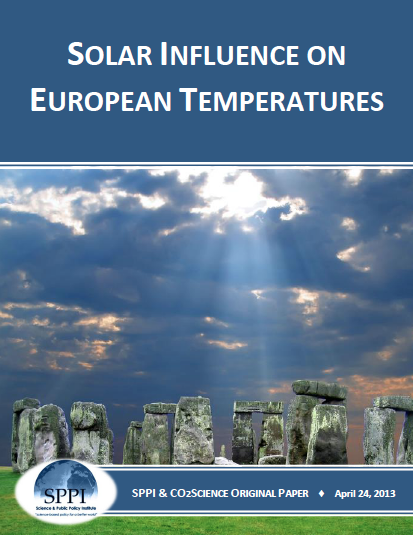 A new SPPI & CO2 Science review paper entitled Solar Influence on European Temperatures finds extensive evidence that solar activity has dominated European climate change of the past 2 millennia which "suggests that there is little reason to attribute 20th-century global warming to the concomitant increase in the air's CO2 content. Natural variability appears quite capable of explaining it all. In conclusion, paleoclimatic studies from Europe provide more evidence for the global reality of solar-induced temperature oscillations pervading both glacial and interglacial periods, which oscillations are looking more and more likely as the primary forcing agent responsible for driving temperature change during the Current Warm Period. The concurrent historical increase in the air's CO2 content, on the other hand, is likely little more than a bit player." "In yet another refutation of the theory of CO2-induced global warming, Mangini et al. found "a high correlation between δ18O and δ14C, that reflects the amount of radiocarbon in the upper atmosphere," and they note that this correlation "suggests that solar variability was a major driver of climate in Central Europe during the past 2 millennia." In this regard, they report that "the maxima of δ18O coincide with solar minima (Dalton, Maunder, Sporer, Wolf, as well as with minima at around AD 700, 500 and 300)," and that "the coldest period between 1688 and 1698 coincided with the Maunder Minimum." Also, in a linear-model analysis of the percent of variance of their full temperature reconstruction that is individually explained by solar and CO2 forcing, they found that the impact of the Sun was fully 279 times greater than that of the air's CO2 concentration, noting that "the flat evolution of CO2 during the first 19 centuries yields almost vanishing correlation coefficients with the temperature reconstructions."